10 of my own favorite drone photos of 2018! I’ve gone through my own blog posts and chosen the 10 best drone photos from this year’s flights! 2018 have been a good year for me and my drone photography hobby. I have managed to work on my drone blog, at least once in a while, and see that I get quite a lot of visitors. I have learned to build my first drone from scratch and is learning to fly it in FPV mode. Right now I have started on my second drone build. 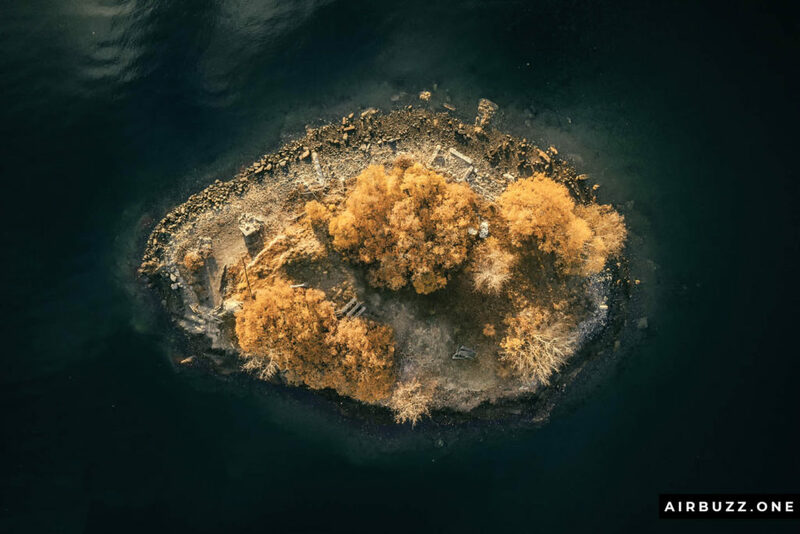 In this post, I will show you 10 of my own favorite drone photos taken by me during this year (2018). I will talk a little bit about each of the photos, why I like them and perhaps what I could do better. You can scroll through more of most popular shots on the Gallery page and read this page if you want to use them on your site or blog. Also read: Review: Eachine E012 is a surprisingly stable and fun ultra-mini drone! 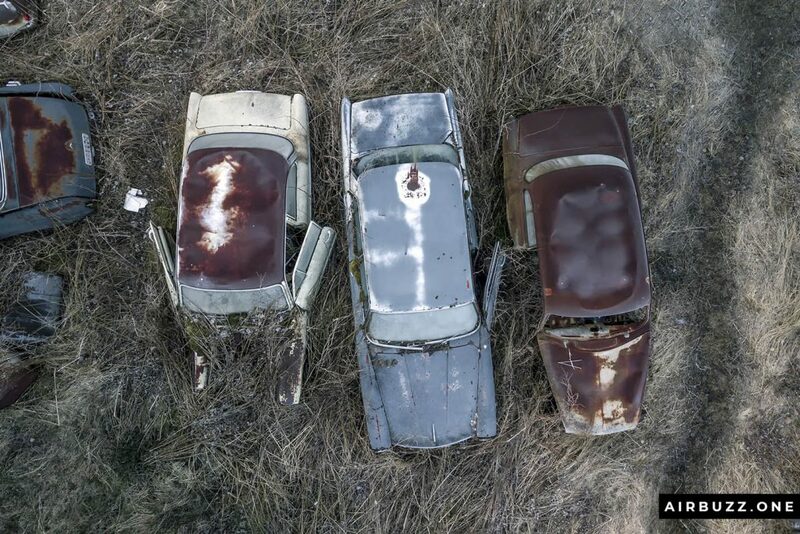 The drone photos of the rusty cars of this Swedish car cemetery came out pretty well and it was a nice trip. Probably one of my coolest and most unique trips this year. I managed to go there when the temperature and morning light was perfect. All the cars had frosty windows and the rusty car bodies seemed cold and icy. I went there all alone and was not disturbed when I flew my done around and above the old and lonely car wrecks. This place is filled with both old cars, emotions, and history. I took a few risks and flew my DJI Mavic Pro drone underneath the treetops as well. I had to be careful not to hit trees and branches. It had a few close calls, especially when the last battery was drained and almost empty, but I managed to land the drone safely on top of an old Volkswagen Beetle after canceling the automatic return to home function. I also did a Youtube video from the clips collected this day. Here is one of the best pics from this series and one of the editions I printed to have on my wall. 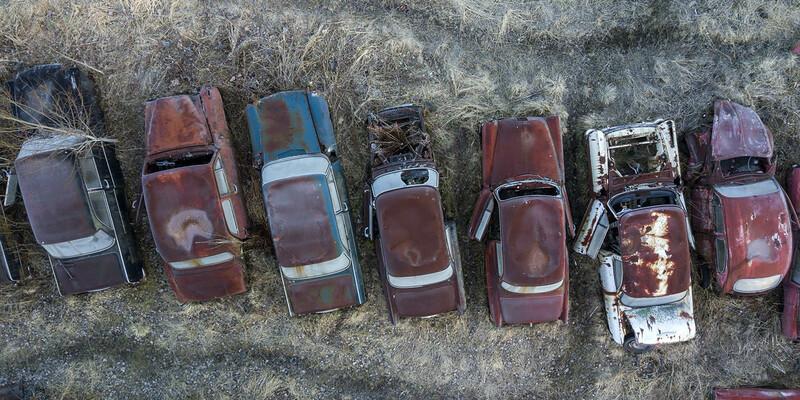 From the blog post: Drone pictures of Båstnäs Car Cemetery! There is an awesome art museum in my neighborhood called Henie Onstad Kunstsenter. It opened in 1968 and is about 50 years old. Seen from above it has many interesting geometric shapes and forms. As seen in the blog post itself (link beneath the picture) I took many single shots of particular parts of the building and artwork in the water. The picture below came out particularly well. In fact, it is stitched together from many different shots since the height restrictions of 120 meters made it impossible to capture the whole building in one native image. I’m not sure what the architect wanted to portray with the building looking like that – maybe it is a sort of footprint? What do you think? It was a great evening and a good drone flight over Høvikodden and the cool art center. 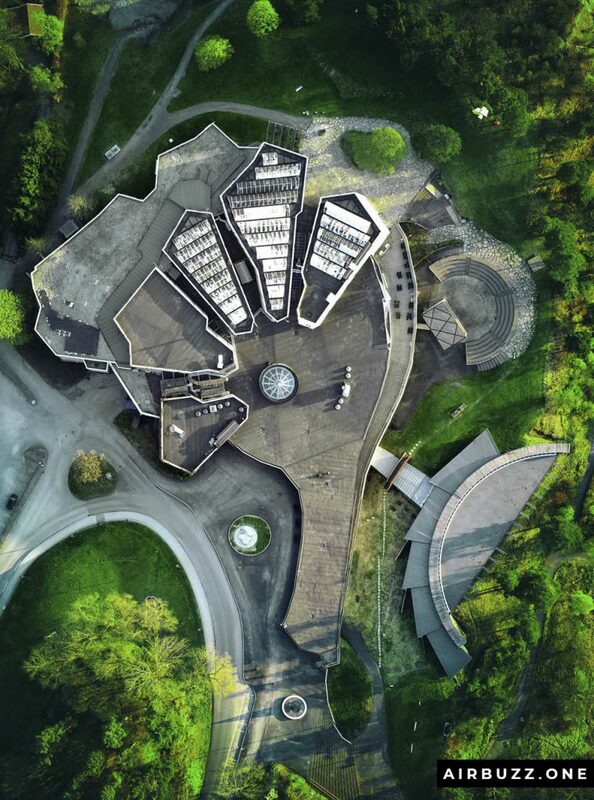 From the blog post: Artful afternoon drone flight over cool architecture! This is a picture from one of the last bike trips I took in the woods during autumn time. The whole forest was filled with trees with orange leaves. Autumn is my favorite season in terms of colors and photography. I came across this simple bridge between two small lakes. When viewed from above the water looks tranquil and silent with the clouds reflected on the surface. Somehow it seems that the bridge is flying and hovering while connected to two islands. 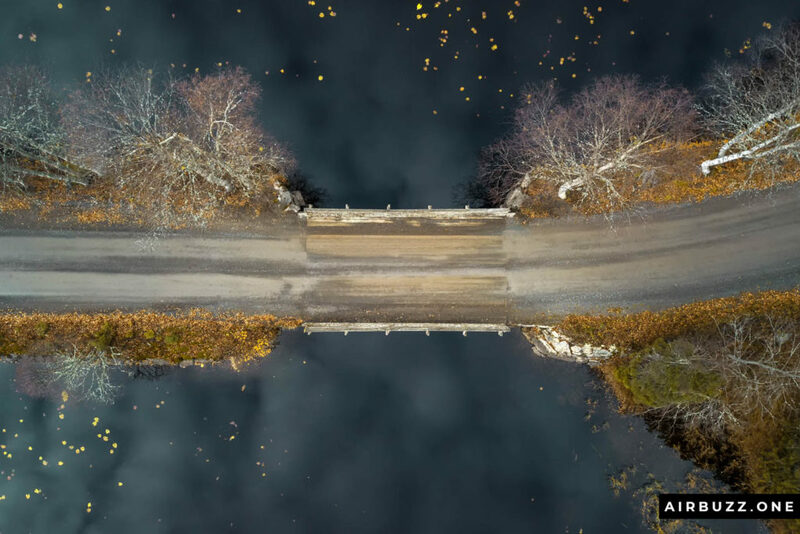 I have heard that people have to look at the image a few times to grasp that it is a top-down shot of water and a bridge. The leaves in the water add another layer to the composition and I think it looks like specks of gold – golden leaves. From the blog post: Bike and drone tour over dams and water! This image was shot early this year in Sandvika, near Sandvika train station, when the snow still covered the town. I saw these two roundabouts on Google maps and immediately thought it looked like eyes or glasses. The small island below in the river ensembles a mouth. I had to launch the drone and take a quick snapshot from above. What do you think? Does it look like a face or is it just me? From the blog post: A nice drone flight above Sandvika covered in snow! I have portrayed this small island named Denmark many times before. I have some cool winter shots of it you can see in the post above. This version was shot during autumn and it looks just as cool and alone, almost floating in the water. Once there was a bathing house and docks on the island, but now only small parts of the ruins are visible. From the blog post: Early morning drone flight over local marina and hometown! 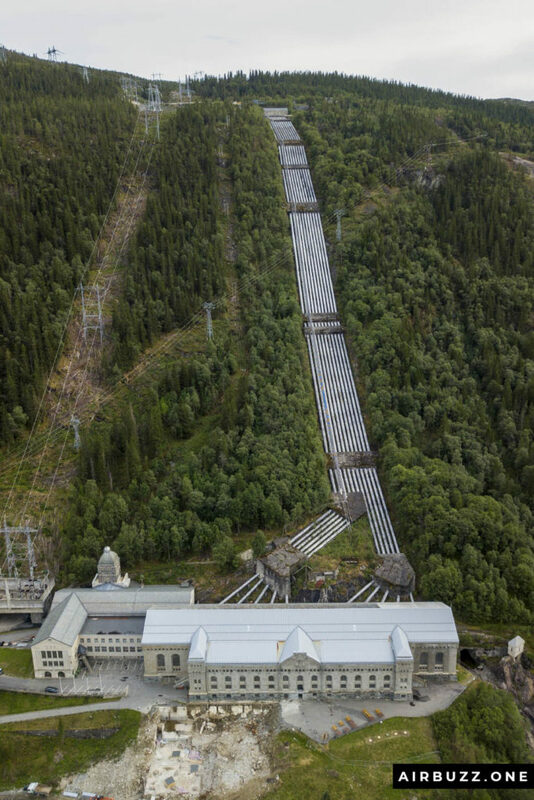 I have to include the shot of the historic Norwegian hydroelectric power plant outside Rjukan, Vemork. Once the largest of its kind when opened in 1911. It played an important role during the Second World War when the Norwegian heavy water sabotage mission that prevented the Germans to get hold of heavy water for their Nuclear weapons program took place here. They recently found the collapsed basement where the explosion took place. From the blog post: A surprisingly high cliff, a tall Waterfall, and a historic Powerplant! 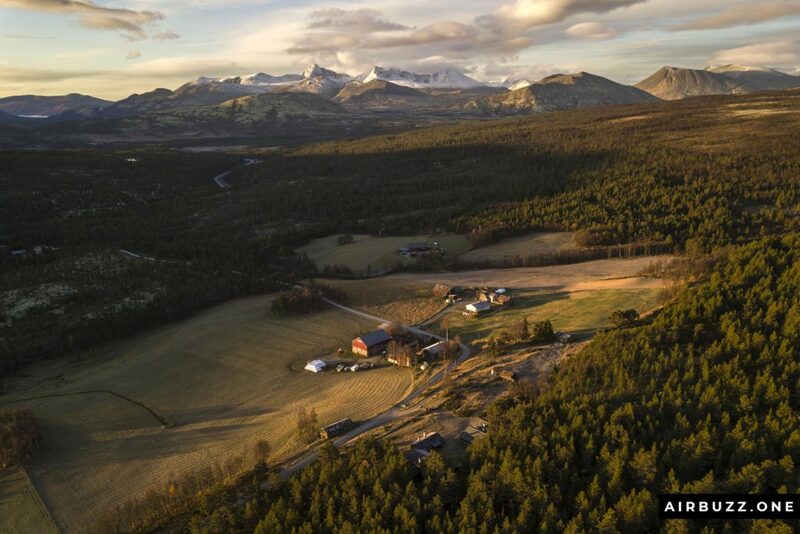 The beautiful morning light of the mountain range Rondane and the farms of Streitlien makes this picture one of my favorites. It was shot on an early morning just days before the whole scenery was covered in snow. From the blog post: The Transition from Autumn to Winter documented with Drone! 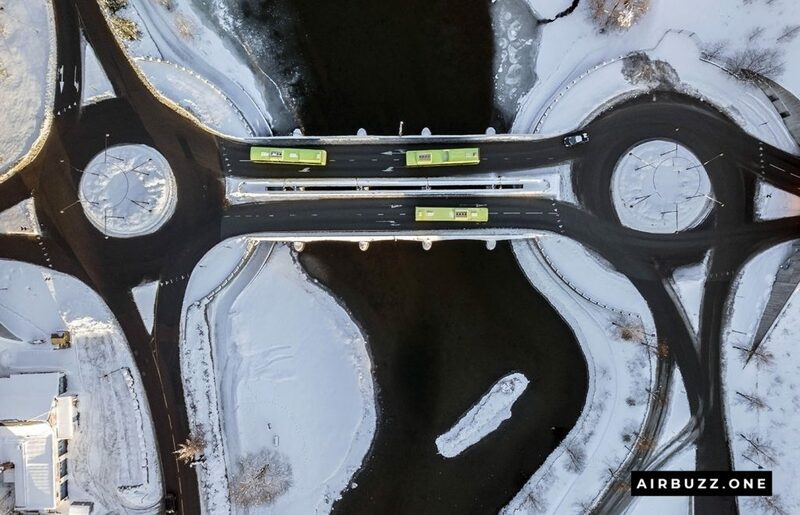 From the blog post: Drone photography of winding roads and a bridge! Ok… a little click bait on the headline there. But I actually captured a phenomenon called fast walker UFO on the video flying past this water. Check out the video here. From the blog post: The hidden lake without fish, but with an old wooden pier and bonus fast walker UFO! Finally, the last of my top 10 best drone shots this year: An old abandoned ski jump. I actually managed to crash the drone in deep snow at this location due to one of the propellers hit a branch, but the drone itself survived and worked perfectly afterward. A bit of luck there, but that’s drone business. 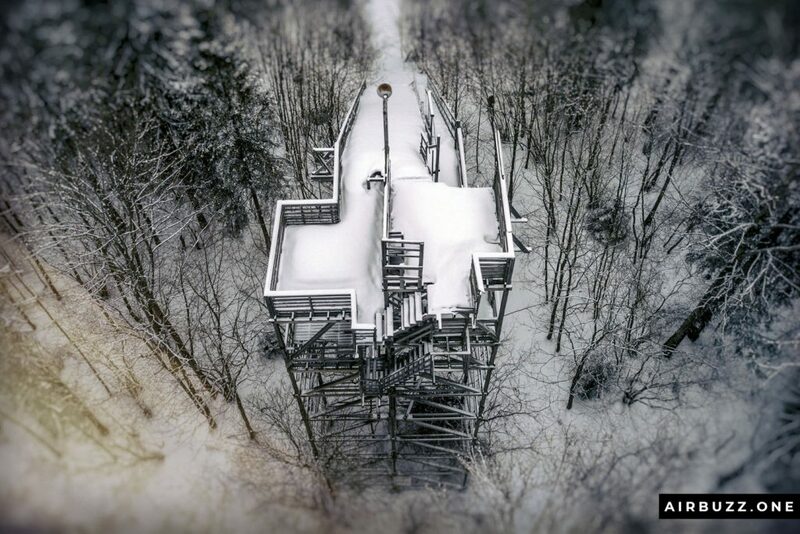 From the blog post: Abandoned ski jump from above! 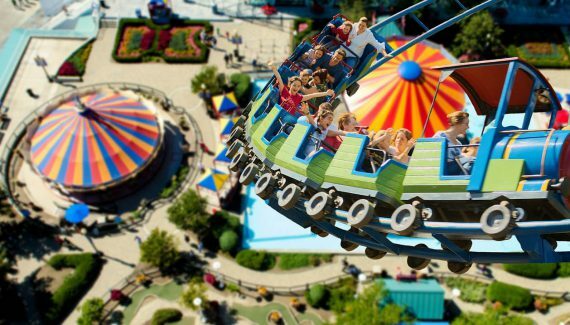 30 Pictures of theme parks, water slides, and fairs shot with a drone! This was one of the most enjoyable posts I have seen in a while. The photos are absolutely award-winning, in my humble opinion. My son is so into photography, and I’m thinking this drone photography thing is going to take him to a whole new level. He loves capturing unusual photographs, and your photographs are sure to inspire him. Thank you for sharing your top ten favorites. I love your site! My son will, too! I must say that this photos are awesome. I never had a drone and now I would like to have one. I did not know that drones can take such nice pictures and what I like the most is image quality. Can you recommend me some drone that is not much expensive? Thanks in advance. Hi Andreas – That is such an incredible collection of photos! My absolute favorites are the mountains, the cars, the smiley roundabout 🙂 and the ski jump. I go droning with a friend – I watch, he controls, they are his deones 🙂 – who is well into photography although most of the places we go are near the sea so few photos have the geometric differences you have in your photos. He does live in a fairly deserted spot and we are aware of airspace restrictions but I will see if we can find more interesting subjects in the future. As well as still photos, he is keen on video and he has captured some wonderful shots of the tide rolling onto the beach as the drone has flown along the shoreline. We also have wind turbines nearby and he flew one of his video drones around it and it was majestic. Normally, we are so far away from them we don’t realize how large they are. I am going to show my friend these photos and suggest we seek out locations where there may be inspirations for more diverse and varied photos. I found viewing this blog post very inspiring. 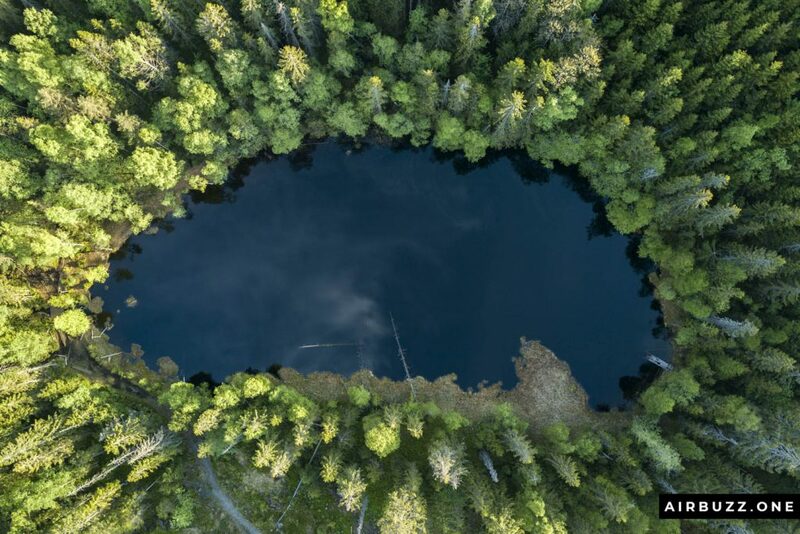 I’m a photographer myself and I’ve been fascinated with using drones for aerial photography. I love the shot of the roundabouts and yes it does look like a face with glasses. I like the one of the car cemetery a lot. – my husband is a car fan and we are always stopping in car lots and looking at the different models. 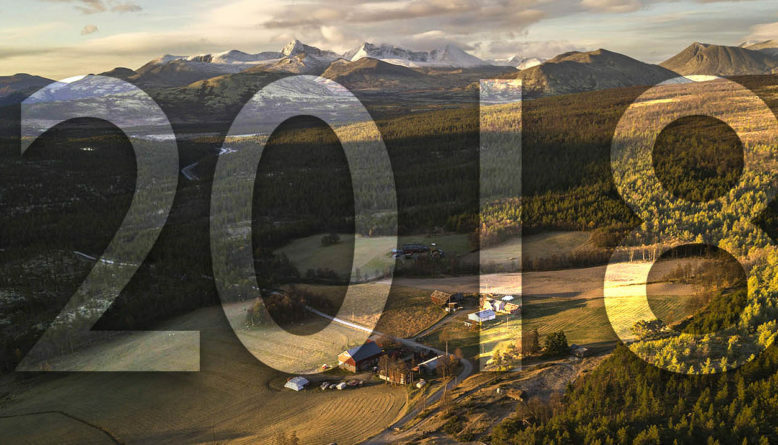 All of the images you captured are great, but I think my favorite image, is the Rondane mountain range shot. I love the light and shadows you have captured. 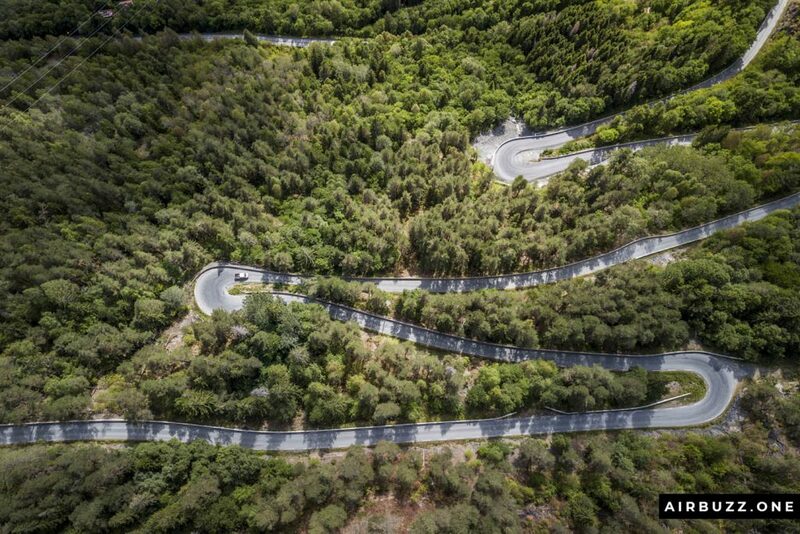 The shot showing the hairpin roads is also great. I clicked on the youtube video of the car graveyard and found it beautiful, but kinda sad too. I enjoy that you add some extra facts and maybe a little history about each shot as you describe it. I followed your link to the review of the Eachine E012 Mini Quad drone and learned a lot reading that also. Hi Shirley! Thanks for the long and awesome comment. I’m pleased that you took the time and checked out a few of my other articles and my Youtube video from the car cemetery. I love the DJI Ryze Tello drone if you want something for a beginner, but if you want to fly further and take better pictures I’m sure that you will have lots of fun with the DJI Mavic 2 drones. They are fantastic and easy to fly as well so no big deal for beginners. It costs a little thou, but it is worth it. I use the previous version, the Mavic Pro for my photography. You find that on Amazon as well.